I could see the pattern. These two passages provide a fairly accurate account of both the aesthetic tendencies and thematic concerns found within Ethical Consciousness. 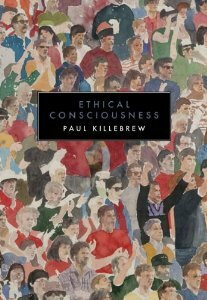 For starters, Killebrew primarily composes poems that contain lines only a few words in length, thus cutting syntactical (and conceptual) units into discrete elements; yet due to the enjambment that pervades the poems, he maintains a fluid movement and coherent rhetoric. To this extent, small “Certainties form” within a line, then “disband” as the poem progresses to the next line. But simultaneously with this formation and deformation, an overall rhythm and logic accrue as the poem proceeds, thus “cyclically realign[ing]” the poem with different words and patterns of thought. In other words, one could say that the poet composes the selections within this book as a “series of / statements,” which he “arranges” and re-arranges into a “dizzying / complexity” of “repeating / …sentences” and concepts. One could argue, then, that the aesthetic of these poems and the ethical consciousness they promote rely on the interplay between micro-level and macro-level poetics, as well as a negotiation between the individual and community. In other words, Killebrew fosters a type of speech that acts as a “vessel / for transporting thought across dim borders” wherein he addresses “an exact person,” but also the “relationships among” persons as they form in “words / in a conversation” (52): a poetry that, both in content and form, seeks to reconcile the differences between part and whole, the singular and the many.